I spent the last two weeks of my winter vacation WWOOFing* on a horse stable in the Jura region of France. The Jura region is in the foothills of the Alps, on the French border with Switzerland. The landscape is Tolkien-like (think Lord of the Rings), with vast cliffs, large rocks, and enchanting forests. A thick coat of moss and, more often then not, a blanket fog cover the ground, adding to the mystical feeling. I spent my days cleaning tack, painting a covered wagon, feeding and grooming horses. I was even able to accompany a tour group on a randonnée – a daylong trail ride. As a self-described food tourist, I was determined to discover the region’s food. And I didn’t have to look far! Hiking one day with a neighbor, I learned all the best spots to find wild mushrooms (unfortunately, it was not mushroom season). I was told the story of Comté – the French cheese which is produced in this region. Comté is made from the milk of cows raised in the Jura region. The milk farmers deliver their milk to the cheese-makers as a collective, allowing them to set the price and prosper. This tradition is embedded in everyday culture – the small square in my village was named “Place de Pesé Lait” – or place of milk weighing. Hunting is also a large part of the culture, with the main target sanglier, or French wild boar. But my best food experiences were the lovely lunches I ate every day with my host family. They cooked primarily using products from the Jura region. Every day was a surprise – blood sausage, sautéed apples, and rice one day, roasted chestnuts and carrots with barley the next. Soup was a mainstay, with homemade varieties like pureed vegetable or garlic and zucchini, served with regional cheese and dried sausage. Lunch was always accompanied with bread, usually a sourdough, and fresh fruit. Every Saturday, the family prepared a special diner for the tourists who came for the randonnées. The menu, traditional of the region and highlighting its products, was a type of cheese fondue. First, they prepare boiled red potatoes, washed lettuce, and smoked, thinly sliced ham. 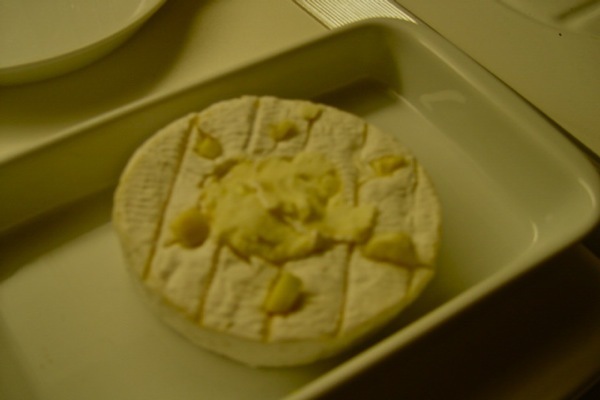 Then they bake Camembert (a soft French cheese) with garlic and a dry white wine. To eat, you place a potato, a slice of ham, and some lettuce on your plate. Then, you carefully spoon the hot Camembert over everything. Some sliced bread is perfect to scoop up all the extra cheese from your plate! The combination of the starchy potato with the fatty cheese, and the smoky flavor the ham makes for perfect comfort food after a long days of riding. For dessert, we had ice cream and coffee/tea. Easy to prepare and fun to eat, try this meal with friends to warm up during the cold winter months. *What is WWOOFing? WWOOFing stands for World Wide Opportunities on Organic Farms. Possible in many different countries in Europe and the Americas (and other continents), WWOOFing provides an opportunity to travel, meet local people, and learn about local customs and farming. In exchange for food and lodging, you work around five hours a day on an organic « farm », with farm having a loose definition (I have worked on dairy farms, vegetable farms, farms doubling as organic bed and breakfasts, and now a horse stable). Stays usually last from 10 days to 3 months or more, and you can travel by yourself or in a pair. I WWOOFed last summer in the USA; you can read more about my experience here. Set a large pot of salted water to boil on the stove. Unwrap the Camembert. Place it in a small casserole dish. Scoop out the middle of each round of Camembert, making sure not to cut through the bottom rind. Return the scooped section back the round, this time with rind-side down (see picture). Make six small cuts in each round, again making sure not to cut through the bottom rind. Peel the garlic and cut the heads into thick slices, one for each slit in the Camembert (12 slices total). Push the sliced garlic into the slits, one slice for each slit. Pour 1/4-cup white wine over each of the rounds. Place the rounds, uncovered, in the preheated oven for about 30-45 minutes, until runny and slightly browned on top. Once the water has come to a boil, add the potatoes. Boil for 15-20 minutes, till a knife can easily be slid into the center of the potato, and the potatoes are nice and tender. Do not overcook – it is necessary that the potatoes can hold together when sliced. Drain the potatoes and keep warm. To serve, everyone should place some lettuce, a slice of ham (or two! 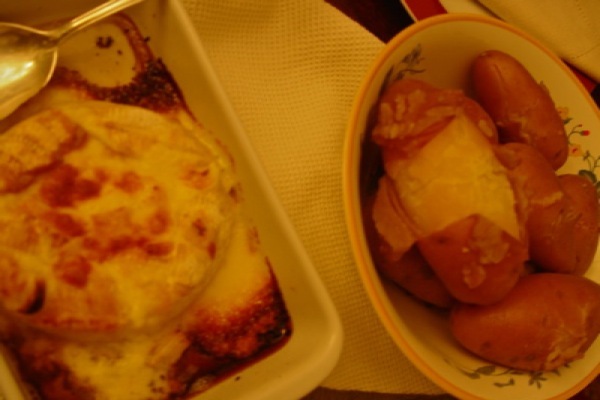 ), and some potatoes on their plate and then spoon the hot Camembert over. Have lots of sliced bread available for scooping up the extra cheese. I came across this blog post when I searched about WWOOFing in France in the winter months. It sounds like you had a great WWOOFing experience from your post! Do you by any chance know if the farm you worked on is still welcoming WWOOF volunteers this winter? If so, what is the name of the farm and farm name so that I can find their profile on the WWOOF website? I am fluent in French and am studying abroad in Lyon next year so I’d love to go early and have as great of an experience as you!